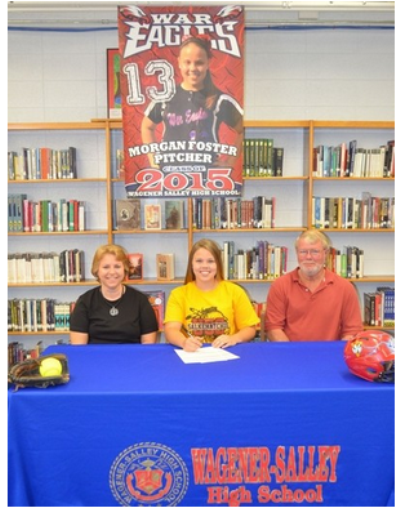 WAGENER — Morgan Foster is special. It’s clear to see based on her performance on the softball field, where the do-it-all player is helping lead Wagener-Salley to one of its best seasons ever. But Foster is more than a softball player, also standing out as a three-sport athlete for the War Eagles on the hardwood of the basketball and volleyball courts. Foster isn’t just a talented athlete. She’s also a distinguished student who’s a fixture on the school’s honor roll. Foster’s academic achievements have allowed her to graduate a year early, making this – her junior year – her final one at Wagener-Salley High School.Impressive as her achievements are, Foster’s more than just what she’s accomplished in academics and athletics – she’s a good person. Inspired by her best friend, who has Down syndrome, Foster said she’s motivated to pursue a degree in Special Education and to one day work as a teacher to help disadvantaged youngsters to have fulfilling lives. Starnes expects Foster to excel in whatever she does, wherever it takes her.“She’s going to dominate,” Starnes said. Noah Feit is the sports editor for the Aiken Standard and has been a professional journalist for more than 15 years after graduating from Syracuse University.